The guillotine's blade fell again, one year later. On December 2017 already, my 5-years-old Youtube channel Sayed Hasan, mainly translating speeches from Hezbollah Secretary General Hassan Nasrallah, was completely removed by Youtube, along with its 10 000 subscribers, +6 millions views and +400 subtitled videos of anti-Zionist & anti-Imperialist content. I then denunced this censorship in detail in my article Kafka 2.0: How Youtube’s Political Censorship is Exercised. And just around New Year's Eve 2019, the +6000 Subscribed Facebook Page Resistance News Unfiltered, along with all its similar content, got deleted without explanation. The only thing left online is a cache view of the page dating back from this summer, in French. I had created this Page at the beginning of 2018, since no other place can compete with Youtube and its near-monopoly on video content, in order to reach a broader audience. But it was deleted without explanation by Facebook short of its first anniversary. I can't even know the precise date of termination. 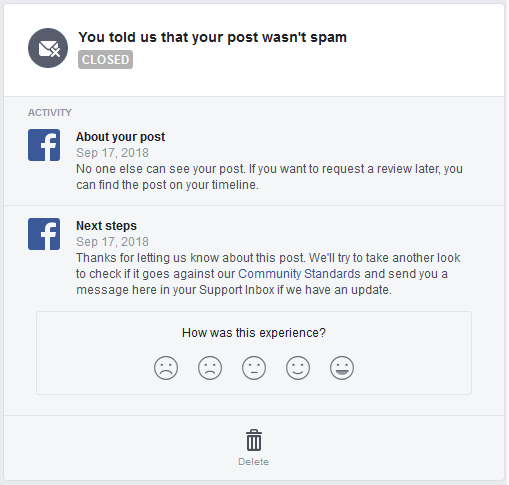 Youtube did at least bother to send emails notifying of the removal of a video or of a whole channel, but Facebook has only internal notifications for posts removals. Here is how it happened. When I logged in on December 28th and saw these messages, I immediately appealed the decisions through the automated procedure, as shown above, though the specific posts alledgedly violating the Communnity Standards weren't even accessible, since they had been removed. It means that I didn't –and still don't– even know which posts got me these "strikes". At least, Youtube was specific about the videos alledgedly violating their rules –three speeches of Hassan Nasrallah–, though they didn't say more than that. I don't know if the whole Page was finally removed because of a third "strike" –Facebook does not even state how much "strikes" you can get before termination– or because of something else, like constant flagging and reports by cyber-IDF soldiers and Hasbara trolls. But I am positive it has to do with my anti-Zionist content. It is a blatant attempt to take down important speech and silence already marginalized voices, as stated by Vera Eidelman from the ACLU. Of course, one should always protest and complain using the due procedures. 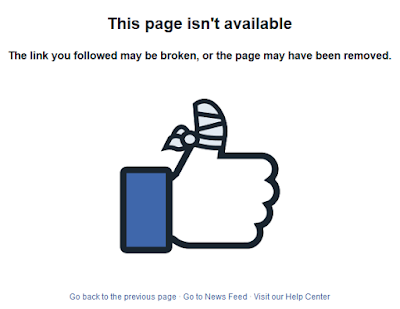 After all, Facebook has been known to restore such Pages after the public outcry following their removal without proper reason (TeleSur, VenezuelAnalysis, etc.). I did protest, and I am still expecting an answer from them, without much hope, since earlier appeals as old as September 17th are still awaiting a response almost 4 months later, as shown below (screenshot dated January 4th, 2019). Appeals are not suspensive. Ever since September 2018, when the crackdown on my page began, tens of tens of my posts were thus removed as Spam or Community Standards Infringement, and a shadow censorship was applied to my page. Thus, my posts didn't appear on the majority of my subscribers' feed, drastically reducing its readership from the thousands to the tens. But it seems it was not enough, and my page was finally completely removed. Without any mention of a motive, corpus delicti and mere notification of removal of my page, not even in Facebook's internal notifications on my personnal account, we are clearly beyond kafkaesque. This witch-hunt against the voice of the Resistance Axis online, especially Hezbollah Secretary General Hassan Nasrallah (I am the main translator of his speeches in English and French, voluntary and non-affiliated), is not new. Over and over again –most often after Israeli-backed indictment campaigns–, in 2012, 2014, 2016 and june 2018, Facebook, Youtube and Twitter closed down all accounts affiliated to the Lebanese –and Palestinian– Resistance, including Al-Manar TV Channel, banned for good. 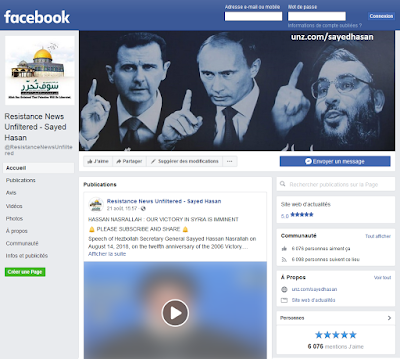 In 2014 and 2016, Facebook was hunting down Nasrallah's very picture and temporarily blocking the accounts that featured it, even though they were individuals having no link whatsoever with the organization: not only Hezbollah's missiles and fighters, but the very voice and picture of its Secretary General are considered as an existential threat for Israel, whose paid trolls keep reporting his videos as terrorist hate-speech to ban mercilessly. The right to information, neutrality or equity is a chimera in the Internet Giants' turf, where only alternative views, especially videos hostile to Zionism, are subject to censorship and banishment. It is a scandal that the speeches of Hassan Nasrallah are banned on Youtube. Whatever one thinks of his politics, it cannot be doubted that Nasrallah is among the shrewdest and most serious political observers in the world today. Israeli leaders carefully scrutinize Nasrallah’s every word. Why are the rest of us denied this right? One cannot help but wonder whether Nasrallah’s speeches are censored because he doesn’t fit the stereotype of the degenerate, ignorant, blowhard Arab leader. It appears that Western social media aren’t yet ready for an Arab leader of dignified mind and person. Thankfully, my first article got the attention of Ron Unz, who offered to safeguard my videos in his own website, and I published them back gradually in a new Dailymotion Channel from where they are automatically saved in The Unz Review's internal storage system. Thus, even if they end up deleted by Dailymotion, they'll still be accessible in one and same place without need to re-upload them again. I will keep posting my videos on Dailymotion –though it has its own, more subtle way of censorship: age-restricting videos, burying them in the search results... –, and I call on everyone to subscribe to my channel on the Unz Review (RSS feed). Whatever happens, the Electronic Intifada to which Hassan Nasrallah called will carry on. Donate as little as you can to support this work and subscribe to get around censorship. Saudi Arabia and Iran: religious or political conflicts?